Our gorgeous destination made headlines all month long, as per usual. Check out some of the top hits below. The Toronto Star&apos;s weekender, The Saturday Star, dispatched a journalist from one of Monterey’s key international markets to include the destination in a six-day road trip feature, Exploring California&apos;s Coast in a Camper Van. Members mentioned in the article were Cultura Comida y Bebida, Carmel Wine Walk-by-the-Sea, Phil’s Fish Market, The Choke Coach, Pezzini Farms, The Vagabond’s House Inn, Point Lobos State Natural Reserve, Elkhorn Slough and Gilroy Gardens Family Theme Park. 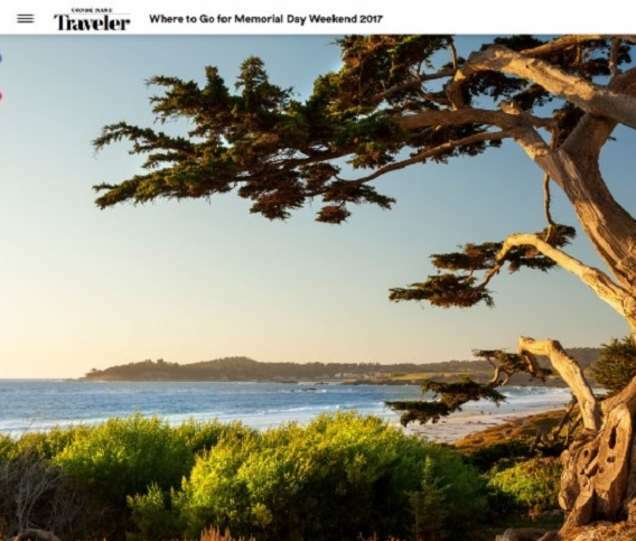 Where to Go for Memorial Day Weekend, Conde Nast Travel is a brilliantly illustrated slide show of American destinations, featuring Carmel-by-the-Sea and recommending greater Monterey County, Big Sur and the Point Lobos State Natural Reserve. Aquatic mammals have been stealing the show all month and SF Gate posted footage from Monterey Bay Whale Watch in its story, Whales Putting on Rare, Spectacular Show in Monterey Bay. Your Copter is Waiting, Los Angeles Times announces the re-opening of Nepenthe restaurant and its Phoenix Shop, the Hawthorne Gallery and the Post Ranch Inn&apos;s Escape Through the Skies Package. Big Sur River Inn and Restaurant, Big Sur Lodge, Ripplewood Resort, Fernwood Resort and Garrapata State Park are also highlighted. The MCCVB&apos;s own Rob O&apos;Keefe, VP and Chief Marketing Officer, was interviewed by Forbes to answer that elusive question, Why Is It So Hard to Market Experiences? Drawing on lessons learned while pitching the intrepid "What Happens Here" campaign for Las Vegas, O&apos;Keefe advised, "Lose the fear. You might be very surprised how successful you can be."